Liberon Wax Filler Sticks are available in a wide range of wood colours. The advantages of an application without a heat source and no shrinkage make them ideal for use on finished furniture and other articles. No key features selected for the Liberon Box 16 mixed 50gm wax filler sticks. 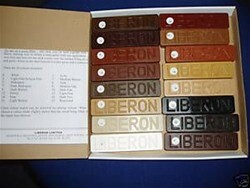 No quantity discount for the Liberon Box 16 mixed 50gm wax filler sticks. Be the first to submit a review for the Liberon Box 16 mixed 50gm wax filler sticks.